I wanted a solid square, it’s not quite as simple as filling in the chain spaces with stitches. 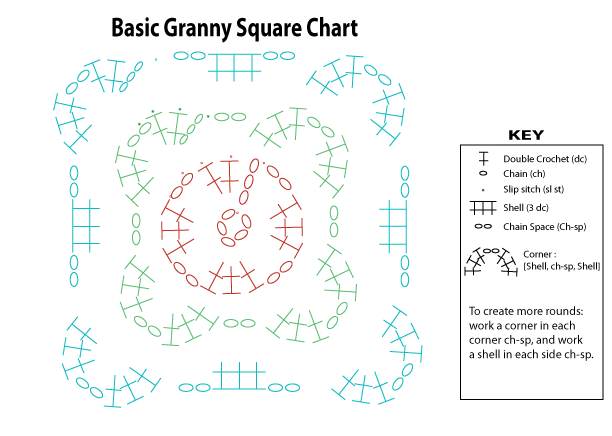 You have to back up and think of what the granny square is, essentially. It’s a circle (with corners). When working a flat circle in crochet, you begin with a certain number of stitches, and increase evenly that same number of stitches each round. Hats and other flat circles often begin with 6 or eight stitches. A granny square begins with 12. Each round is an increase of 12 stitches (i.e. 12, 24, 36, etc). So, in a solid granny, you can get that 12 stitches in a number of ways. One would be to reduce the number of stitches at the corners to 3 instead of the traditional 6 plus the chain space. This works, but I found it didn’t look “corner-y” enough for my taste. Better, it turned out, to work 5 stitches in the corner, and skip the two stitches on either side of the corner when working around. Or, as I did below–keep the corners “normal” and decrease elsewhere in the square to even things out. I like this square a lot, but it’s not what I needed for the blanket, so I’ll keep it for future use, or maybe just write up the pattern for the square itself. My mind has also been on spirals lately. I’ll post again soon about my spiral-square (or square-spiral) experiments.